The entryway corner came together easily once the little painted table found it's home there . The best part is that almost everything I used was moved from somewhere else in the house or repurposed from things I already had on hand. I finally got around to making a chalkboard out of a thrift store frame I've had for some time. We're having fun coming up with phrases each week...this one is a nod to my husband and my adult daughter who has returned to the nest for a season. Guess who gets to be in the middle of those discussions? That's a story for a whole other time.. This little basket was a gift from my mom. I think its original purpose was to hold utensils and plates for eating outside. I've filled it with little things I found around the house. The corked bottles were a $1.00 a piece at Michael's. I can see them filled with single stemmed seasonal flowers. This pair of silly, chubby chickens were tucked up high on my buffet shelf. I like them much better down here free ranging in the open. Now that I've decided on my color scheme of yellow, white, black and red, I am happy with the way the front of the house is flowing together. My next project is making a white slip cover for the chair and ottoman you see in the living room and to paint the drop leaf table beside it my new favorite cornbread yellow. All my recent purging has involved a few trips to drop off items at my local Goodwill. I've been careful not to go into the store to take a look when I make my drops or I could easily bring home as much as I leave behind. I'm hoping once this gathering habit of mine becomes a distant memory, I'll enjoy the thrill of the hunt once again. They say it takes 21 days to form a new habit...let's see if I can go 21 days without bringing anything new into the house. Love your entry way! Perfect and inviting! 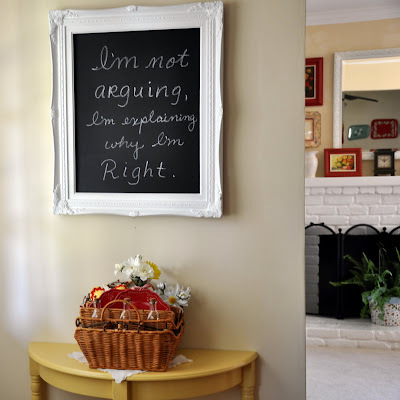 The chalk board was a unique addition to the entryway and I love the sentiment! 21 days? hmmmmm. 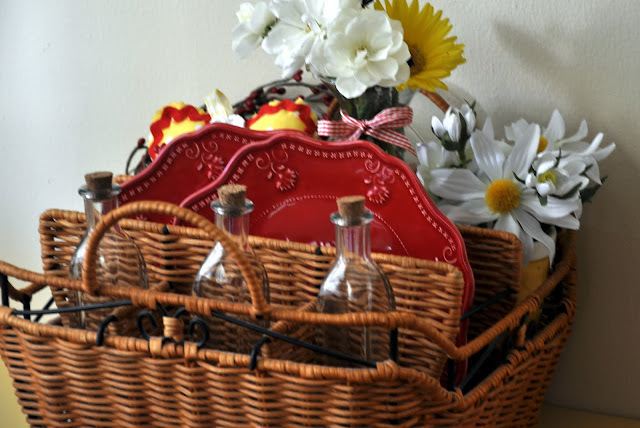 Love that yellow table and what a great basket. Cute phrase! The whole collection turned out great. I love the chickens, so cute! Patty I loved your house already but I love the color scheme you picked out. You have a real knack for display and I always love to see what you are up to. Best of luck on developing that new habit. Let me know how it works for you, then I'll know if there's any hope for me in that area! I like that cornbread yellow and am thinking of doing my cabinets that color. It looks like a color that would be great for all seasons. My kitchen, dining room and living are all open to one another, so I have to choose a color that works for them all. I always love to see the changes you're making in your home.It inspires me to get off my duff and do something! 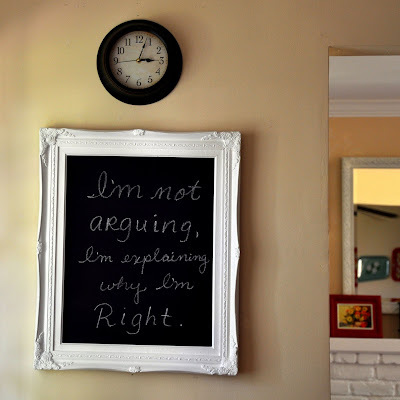 Love your chalkboard and the quote! I love your post! Good luck on the 21 day thing!! It would take great will power to not walk through Good Will if I was at the Good Will! Very proud of you! I love your quote on your chalk board...might have to borrow it! Hey sweet lady! :) You KNOW I love that chalkboard..it looks just like mine! lol I love it when I can re-do an area in my home with stuff I already have on hand. Yours turned out cute! Coming together so nicely. 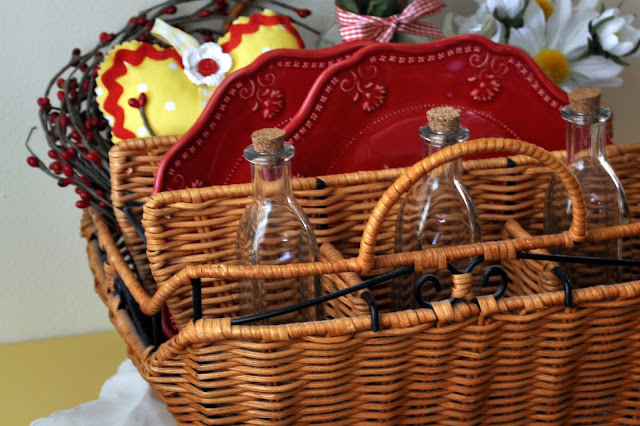 Really like the colors you have chosen and the basket is too cute! Love the way you have accessorized it! It looks lovely what you have done. 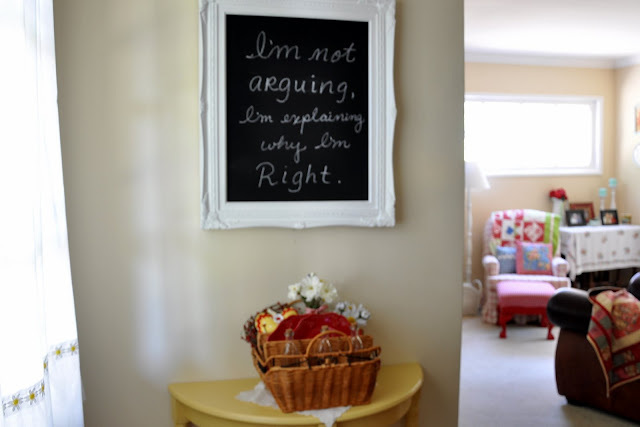 love the frame/chalkboard, and the saying! What a lovely inviting entry way, I adore the whimsy chickens. I love your fireplace and that cozy spot in the corner for curling up with those quilts. Very relaxing place you have there. How darling it that. Those red plates are real eyecatchers! Love your new entry way and the chalk board looks so pretty. I love the phrase on it too! Am off to see the other blogs you mentioned now. Have a great week. Patty, it's so obvious that your home is filled with love and quite cozy. 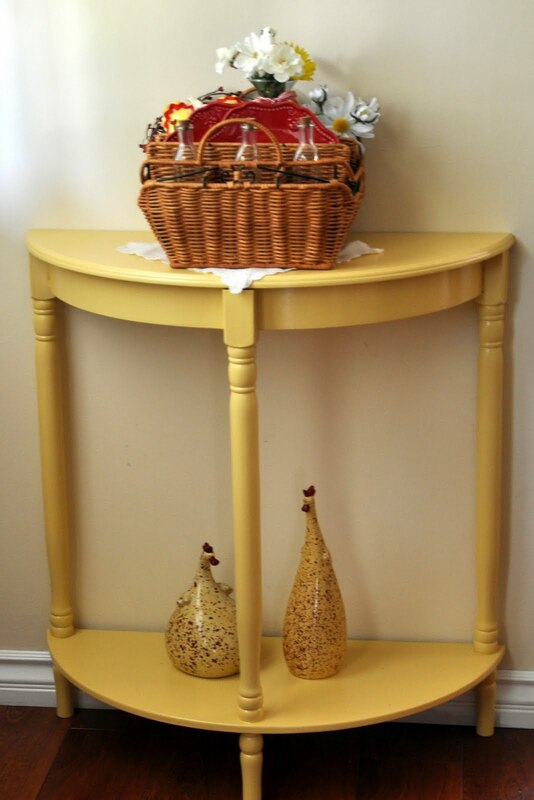 Love the table.It looks great in your entry.Thanks for sharing. Please drop by to see my mellow yellow when you get a chance. Have a lovely Monday! the entry looks great..love the chalkboard! Love your new color scheme, your table decoration is very inviting.. I must say I love what's written on your blackboard! !